Alpha Nursery & Garden Center hours are from 10AM to 5PM April 15th thru October 15th. From July 15th to August 30th our summer hours are from 10AM to 3PM daily. Currently we are closed for the season. We are however open by appointment. We check our messages daily and can still ship throughout the winter. Please call or fill out a contact form located under "Home Tab" and we will get back to you! Thanks for your support!! Fall Clearance Sale 30% off on Trees, Shrubs and Perennials going on now! 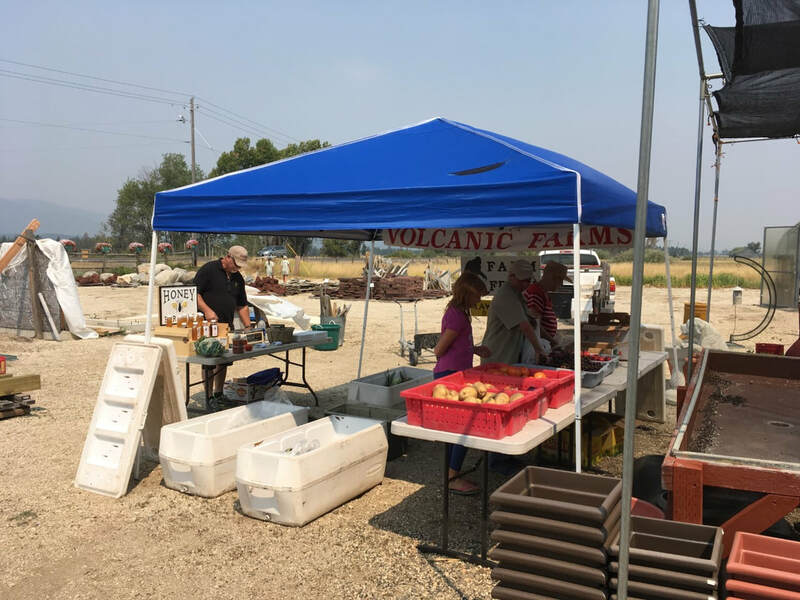 Wednesday 10AM to 1PM Volcanic Farms brings fresh produce, pies, and honey. Saturday from 3:30 to 5PM Nature's Table Farm bring fresh produce. Alpha Days this coming weekend. See below for details. ​Hello, We will be at the Boise Flower and Garden Show next week, Friday March 23rd through Sunday, March 25th. We will be at booth number 214 as Alpha Organics. We will have our special organic fertilizer combo, Alpha Three Complex. My husband, George will be manning the booth so stop in and say Hi! Hope to see you there! Hello All, We have some exciting announcements of things up and coming! There are 10 Raised Garden Beds at the Pride of the Pantry Plots still available. 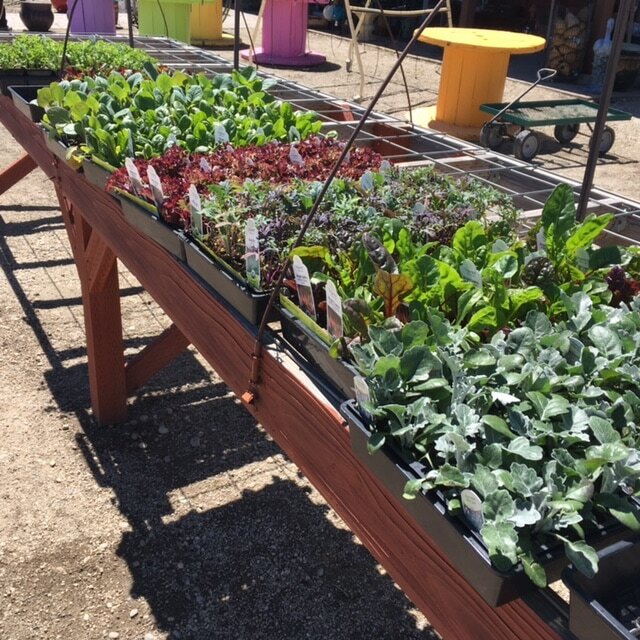 If you don't have room or space for a garden or fresh veggies at your home, you can rent a plot at Pride of the Pantry Plots located at the Cascade Food Pantry across from the airport. Contact Pride of the Pantry Plots on Facebook or mrbhines@gmail.com. 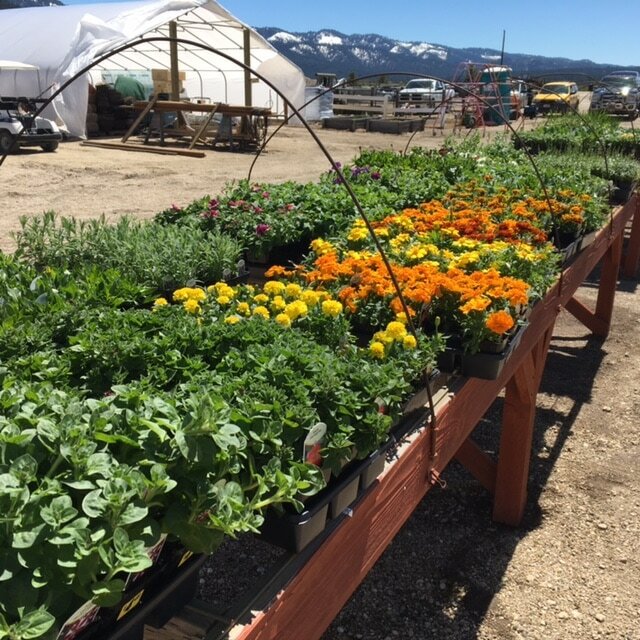 Our Proven Winner Flowers arrived on Wednesday and we began planting up all of our Custom Grown Hanging Baskets and also the boxes that adorn our fence every season. If you would like to see how we do this, stop on by and head to the greenhouses from 10AM to 3PM this coming Monday through Wednesday. Thursday, March 15th at 5:00 PM at the Cascade Food Pantry join us for a Seed Starting Class until 6:00PM. Tired of winter and longing to start your garden. Now you can start to garden in March. Following the Seed Starting Class, Participate in a Seed Exchange sharing seeds with others. There is a threat to our pollinator bee population which poses a concern to the pollination of our crops. There is an answer to this problem. The gentle Mason Bees and Leaf Cutter Bees are excellent native pollinators. You will increase fruit production and the yield from your garden by raising and caring for these native bees. You will be able to place an order for bees, bee homes, and accessories at the seminar. The first week of April we receive all of our tree liners (Bare root) and start planting them up for sale later in June. I will be sending out a list of these trees and shrubs in case you would like to pre-purchase before they run out. Fall Newsletter with lots of good information on planting and on Voles. Attack of the Voles! Fall is here! And along with that we are beginning to see voles appear in our yards. Here is an article that explains a bit about the voles, how to repair the damage, and how to get them out of your yards. Music by George Greenfield, Buggy rides down Alpha Lane pulled by Clydesdale Horses, Free Lunch served at noon with Hamburgers, Hot Dogs, Salad, Chuck Wagon Beans, Chips, and drinks. Yummm! 2017 Spring has Finally Sprung - New shipments are arriving daily. Just a peek at our latests arrivals. Alpha Days coming this Saturday and Sunday, June 24th and 25th! 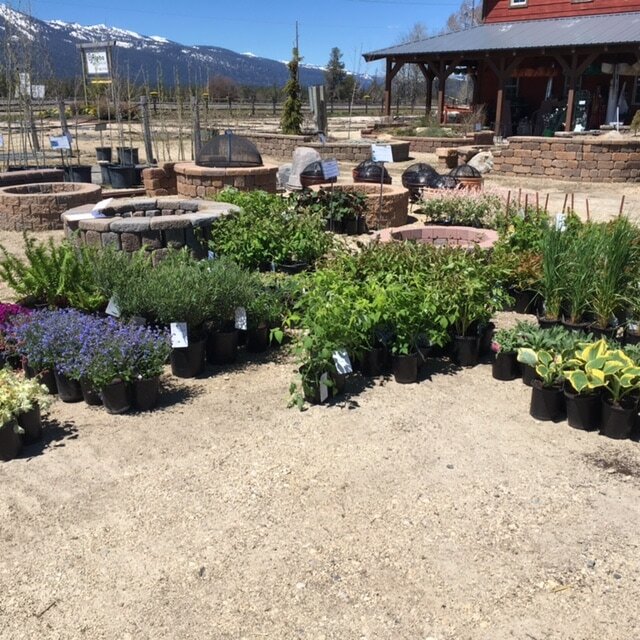 Take advantage of a sale on trees, shrubs, and perennials!!! 1 pm Door Prizes Awarded: Many nice prizes from our suppliers. Bring the kids and take pictures of them with the Clydesdale Horses! You will like these new reference Theme Handouts. They will help you in planning your plantings. Choose from Deer Resistant, Drought Tolerant, Native, and 23 other subjects. You can download a PDF and print each one out or you can click on a handout and then click each plant listed that will take you to a page on the website that gives you all the information about that plant. Enjoy! Alpha Nursery & Garden Center features Renee's Garden Seeds as our flower and garden seed supplier. One of their commitments to those that like to garden is to give credit to our store for a certain amount of seeds not sold during the season. We then donate those seed packets to an organization that can make good use of the seeds.